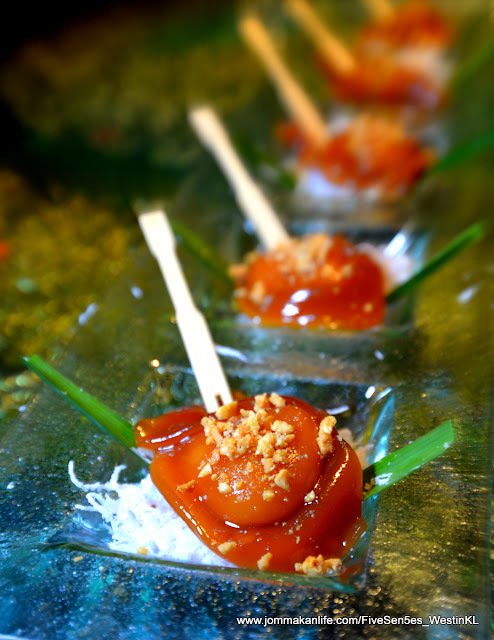 Award-winning Chinese Chef de Cuisine Tan Tzaan Liing and his team proved they have a lot of bite when it comes to rustling up Chinese New Year specialities for Five Sen5es to herald the arrival of the Doggie Year. Welcome the CNY with a resounding bark of joy where three exquisite set menus, a selection of Yee Sang and an enhanced festive à la carte menu beckon until 2 March 2018. 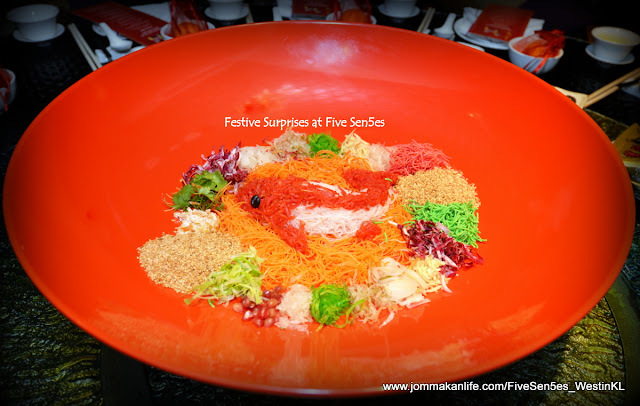 Presented in a huge fire engine-red lacquer dish, the assortment of shredded vegetables, pickles and condiments formed the auspicious shape of a koi fish. 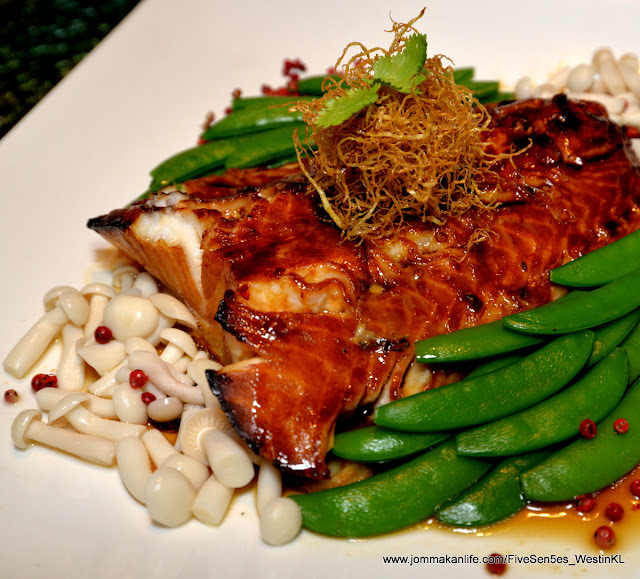 Norwegian Salmon Yee Sang made quite a splash, enlivened by delicate fruity-sweet plum sauce – a house concoction. Thumbs up to the balance of fresh and dry ingredients brimming with sumptuous accents. 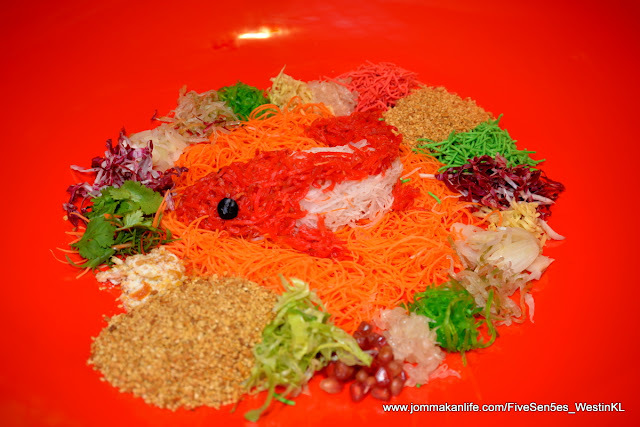 Premium sashimi and abalone are the other Yee Sang variants available. 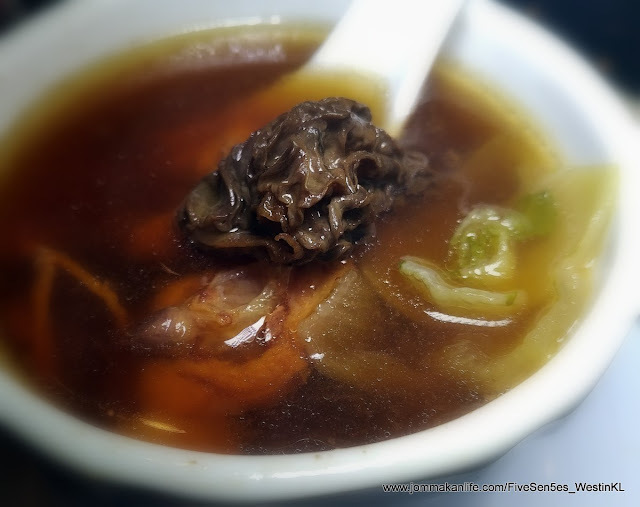 Heartwarming and restorative, the Doubled Boiled Dried Scallop and Morrel with Baby Cabbage Soup drew raves on its artful melding of East-West influences. The general consensus? 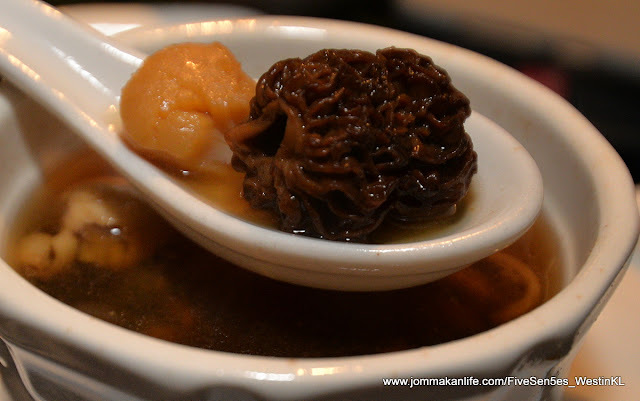 A notable departure from the usual ho-hum broths especially with the inclusion of earthy morel into the equation. 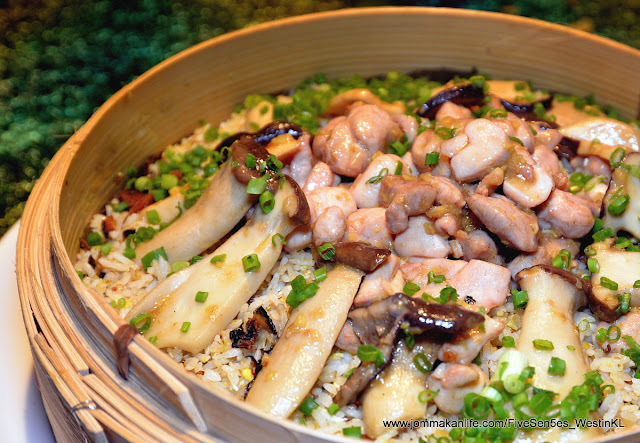 Drawing inspiration from the Foochow culinary heritage, fermented red yeast rice joined the chef’s arsenal, to bestow a salubrious dimension to his Braised Duck with Red Yeast Rice and Peanuts. 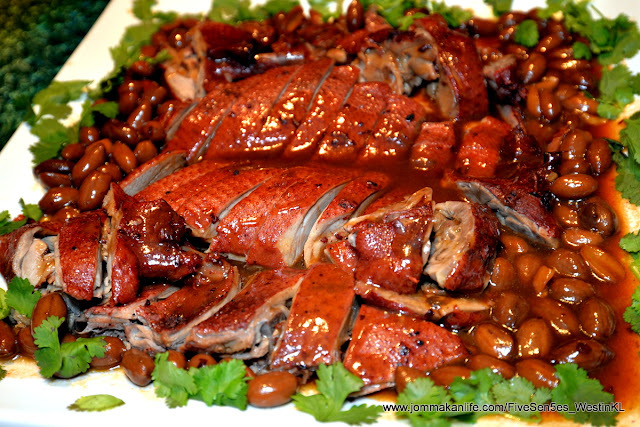 Complex, well-rounded sweet-savoury flavours suffused our palate as we relished every mouthful of the meltingly tender duck and soft peanuts. 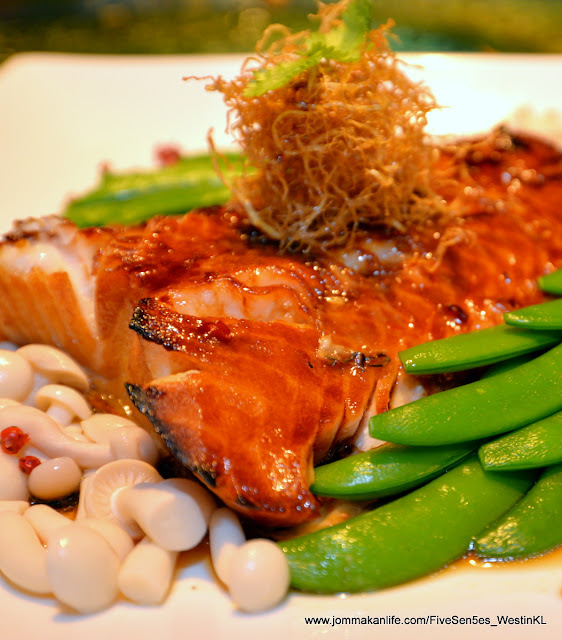 The rave parade continued as we took a shine to the exquisite Honey Glazed Baked Black Cod – a large slab of boneless cod fillet which cut a definitive swathe among the sea of tried-and-tested steamed fish dishes. 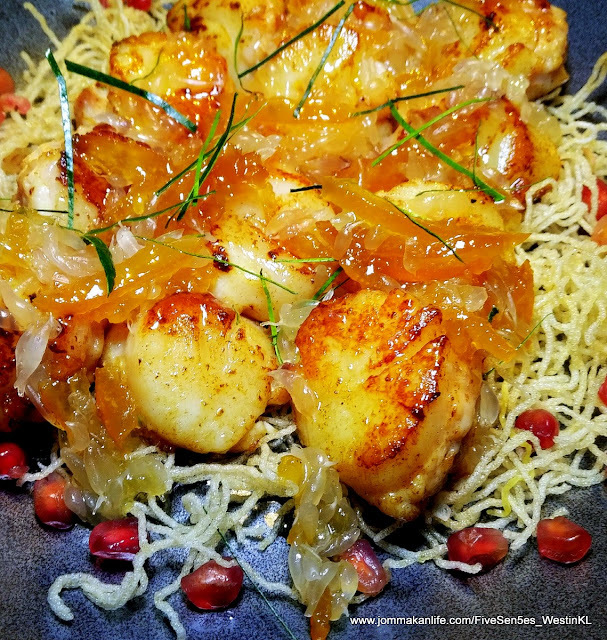 According to Chef Tan, his Pan-Fried Scallop Stuffed with Minced Chicken and Topped with Citron Salsa was construed to symbolise togetherness and joy – an astute clarion call us foodies were happy to answer. 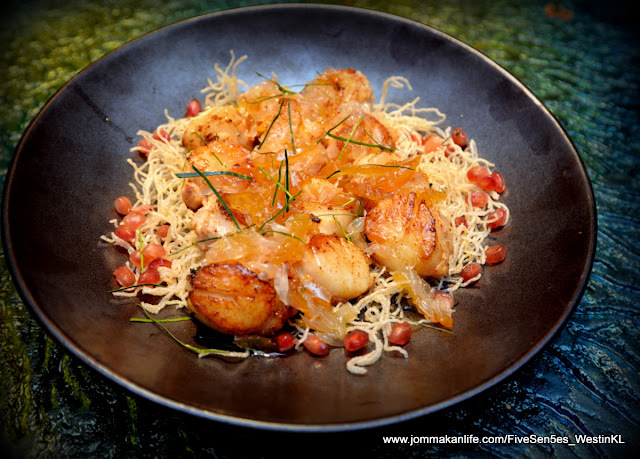 From the plump tender scallops to the bits of candied citron used, every element fell into place harmoniously. 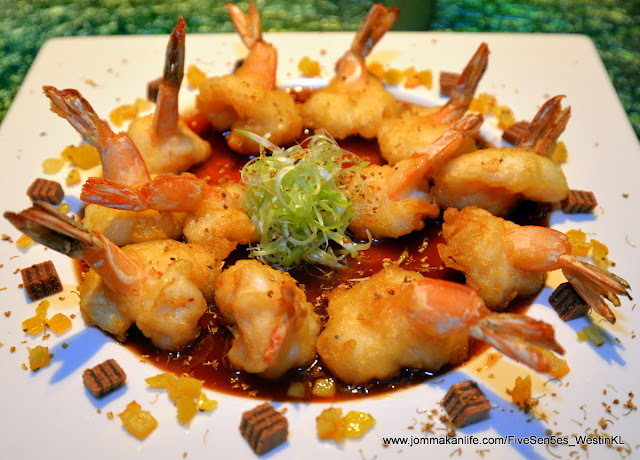 The tangy-floral nuances of hawthorn and osmanthus bloomed on our tastebuds as we devoured the Deep-fried Prawns with Hawthorn Sauce and Osmanthus. 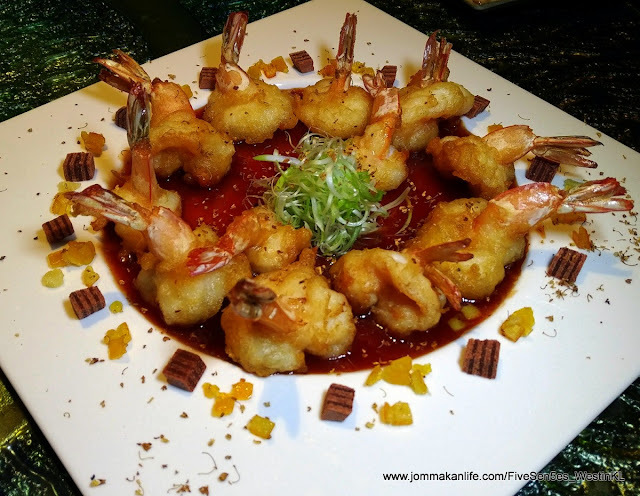 Created to evoke happiness as prawns denote laughter for the CNY celebration, the delicious crustaceans left us smiling from ear to ear. 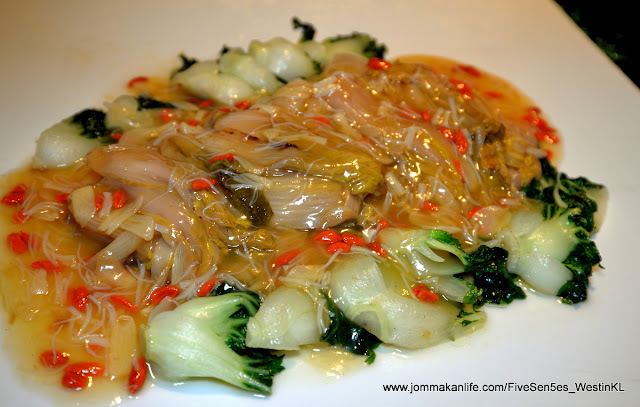 After such a riotous show, more delicate flavours emerged from Stewed White Baby Cabbage with Dried Scallops & Slivered Garlic. We welcomed the coy offering to the fold as it then allowed the Fried Rice with Sesame Oil, Diced Chicken and Chopped Young Ginger to steal the show. A notable speciality to ‘rice’ to the occasion, the hearty serving had us going for repeat helpings. 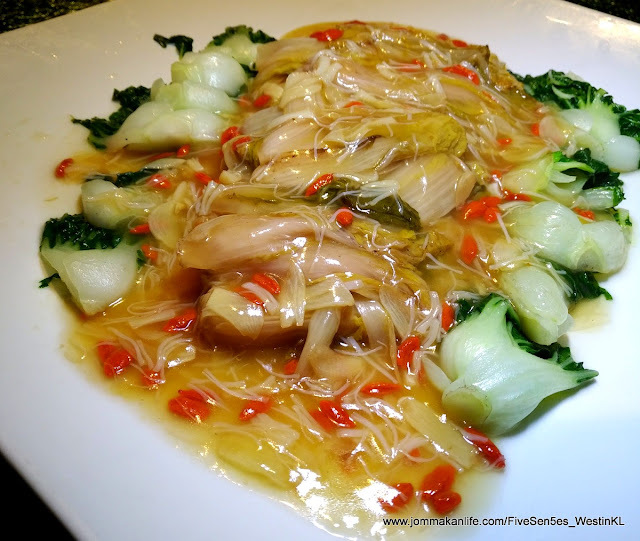 Again, the dish tugged at our familial heartstrings, transporting us down the memory lane of nostalgia. 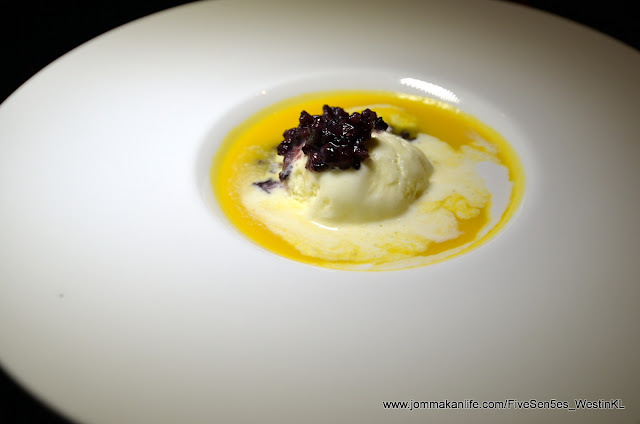 Wrapping up this fabulous sensorial overload were Chinese New Year Nian Gau and Sweetened Chilled Pumpkin Cream with Black Glutinous Rice & Ice Cream. 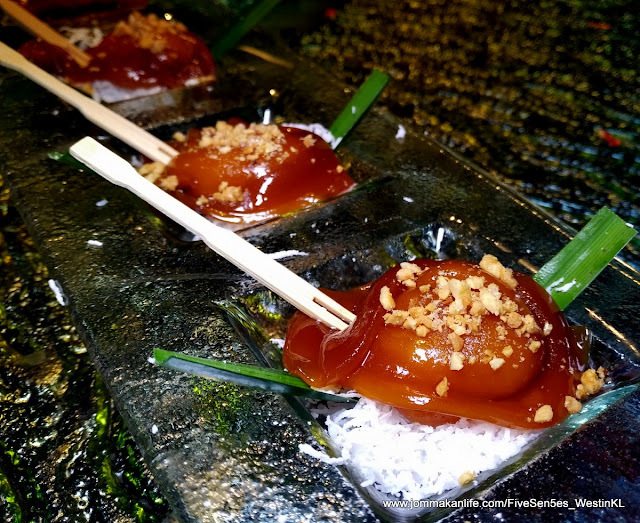 We swooned over the Chinese ingot-shaped sticky rice cake coated with freshly grated coconut and gamely found tummy space for the dessert broth. 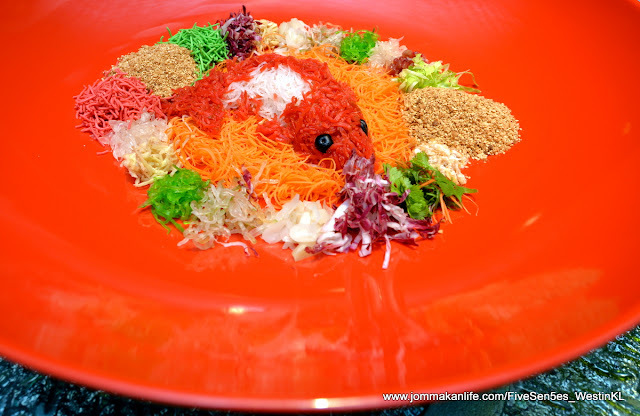 Prices for Yee Sang start from RM68 nett upwards per standard serving and the festive special will be available from now to 2 March, 2018. Three set menus comprising Happiness, Blessings and Abundance are priced at RM1,888 nett, RM1,988 nett and RM2,288 nett per table of 10 persons respectively. Absolutely love the dishes here!